Founded in 1956, the Management Development Institute of Singapore (MDIS) is Singapore’s oldest not-for-profit professional institute for lifelong learning. In the 1980s, MDIS’ focused on forging global partnerships with Universities from countries like UK, USA, Australia, etc. The year 2008 was significant for MDIS as we opened our first overseas campus in Tashkent, Uzbekistan. This was the first ever venture of a Singapore education provider into Central Asia. MDIS’ global perspective has gone further and in July 2012, the Ministry of Higher Education, Malaysia, approved the establishment of an MDIS campus with the approved name, KolejMDIS Malaysia. Set to open its doors in 2018, MDIS’s second overseas campus, a RM300 million self-funded investment project is the first by a Singaporean group in Johor, Iskandar. Set against the backdrop of ageing population, Singapore’s healthcare landscape will inherit the standard challenges and will pose a few that would be specific to a predominantly geriatric population. This signals the continued and increasing need for nursing and other healthcare professionals. Thus, MDIS has set up a dedicated Nursing School for the training and education of nurses pursuing their post registration degrees. The MDIS School of Nursing has partnered with Edinburgh Napier University, UK, to deliver a two-year Bachelor of Science Nursing (Top-up) programme which is accredited by the Singapore Nursing Board. MDIS is also committed to provide conducive learning environments which include hands on learning practicum in dedicated classrooms, lecture theatres and in-house customised Nursing equipment. Set to open in 2018, Kolej MDIS Malaysia will be equipped with state-of-the-art infrastructure such as campus-wide WiFi connectivity, fully-equipped computer laboratories, and dedicated lecture theatres. In accordance with the institution’s green initiative, the campus will also dedicate to approximately 40 percent of its 30.07 acres of land to incorporating eco- and disability-friendly features such as solar panels, rainwater collection tanks and glare shields to minimise water and electrical usage. Kolej MDIS Malaysia will offer courses in Business, Tourism & Hospitality, Mass Communication, Information Technology, and Digital Media. All of these courses have already received the Malaysian Qualifications Agency’s (MQA) Accredited and relevant course licences. Our Iskandar Campus will allow MDIS students transnational education, in which they can study at different geographic locations so that they can become global professionals. Our existing campuses in Singapore and Tashkent in Uzbekistan would also allow students from the Iskandar Campus to do twining programmes so as to enjoy an international educational experience and exposure. We constantly review our courses and facilities to ensure industry relevance. As a forward-looking institute, the foundations of new programmes and facilities are strategically laid before the industry realizes its needs. This equips students and mid-career professionals with future-ready skills for evolving industry demands. 2. What are some of its biggest achievements to boot? Since the 1980s, MDIS has been putting much effort in globalizing our “Singapore Brand”. Apart from the main Singapore campus, MDIS has three international campuses – Tashkent, Uzbekistan; Johor, Malaysia; and Chennai, India, set up in 2008, 2013 and 2015 respectively. In 2008, our first MDIS overseas campus was opened in Tashkent, Uzbekistan. From an initial batch of 240 students, we have at present, more than 3000 students from all regions of Uzbekistan studying at MDIS Tashkent; including international students from South Korea, Ukraine, Afghanistan, Kyrgyzstan, Tajikistan and Kazakhstan. MDIS also has representative offices in China, India, Indonesia, Sri Lanka, and Thailand, as well as agents throughout Southeast Asia. Another key aspect of the MDIS Mission, being socially responsible, is realised through the institute’s Education Trust Fund. 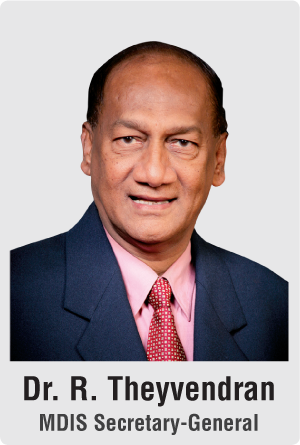 The MDIS Education Trust Fund was established in the year 1999 and does not receive any funding from the government. The awards are made possible solely with the kind contributions of well-wishers and surpluses from MDIS. Since the inception of the MDIS Education Trust Fund, we have been raising funds annually for the bursaries and scholarships. The primary objective of the MDIS Education Trust Fund is to support needy and deserving students who have financial difficulties in pursuing their education in Singapore. We firmly believe in education as the key to sustaining the economic growth and social fabric of Singapore, by means of investment in human capital and providing opportunities to narrow the income gap. Over the years, more than 7,500 scholarships and bursaries totalling nearly S$6 million have been awarded. The MDIS Residences@Stirling is the very first hostel in Singapore to be awarded the Green Mark Gold Plus Award. Costing S$80 million, the new 15-storey hostel consists of 782 air-conditioned rooms, 14 suites, a lecture theatre and cafeteria. The eco-friendly hostel can accommodate some 1,700 students and is fully-integrated so that students can live, learn and play in an interactive and conducive environment. 3. Competition is getting stiffer in the industry – how is MDIS coping with that? Externally, to stand out from the compeititon, MDIS focuses on providing students a unique MDIS study experience through technology and infrastructure, future-ready skills and knowledge and equipping them with the confidence and soft skills needed in their careers when they graduate. MDIS constantly plans for infrastructure improvements in order to provide the necessary environment for our students to learn and develop industry relevant skills. Gaining the practical skills through specialty equipment will boost in their employability when they graduate. The newly launched MDIS Bakery and Culinary studio has been built to nurture and help students master skills required by the F&B industry. The facilities have acquired WSQ Approved Training Organisation accreditation. Not only does this benefit MDIS students, the public can even take up short culinary workshops with MDIS in the studios. For our new School of Nursing, we have in the pipeline, 2 dedicated classrooms with specialty nursing equipment for students to practice theories and knowledge gained. Up to 5 dedicated classrooms is expected to cater for future growth. The School of Engineering will also be acquiring 2 additional types of 3D printers. Currently, the School has 3D-printers making use of extrusion technology. With the acquisition of a powder bed and a light polymerized 3D-printer, student’sknowledge about design and manufacturing will be expanded and also, having the opportunity to practise theoretical concepts on the actual machines they will come across in the industry. Expanding over next 5 years, MDIS will be turning traditional classrooms into collaborative communities of learning; driving student engagement and successful learning outcomes. E-Learning technology will allow instructors to capture audio and video content, providing students with on-demand access to course content. MDIS will be aligning and mapping various academic programmes to the WSQ framework. MDIS students can thus be confident that the skills/knowledge acquired from their courses are of high quality and accepted by the industry here. The 9 areas are Engineering, Fashion, F&B, Health & Safety, Healthcare Management/Support, Information Technology, Leadership and People Management, Life/Health Sciences and Media & Communications. Internally, we have a strong culture of making use of feedbacks and data in our decision making processes. This allows for MDIS to manage resources better. Be it in the development of new programmes or process changes in view of productivity, MDIS encourages a culture of feedback from employees and making use of other comparative data. Such information will allow MDIS to make informed choices, which is an edge in terms of cost-savings, productivity increase or market acceptance. 4. How is MDIS differentiating itself from the rest? Generally people have a concern on PEIs on the quality of their academic programmes as in essence, people do view PEIs as commercially driven organisations. This is where MDIS strives to differentiate ourselves from the rest of the PEIs in Singapore. Being the oldest not-for-profit educational institute, MDIS has always been aware of its role as a caring corporate citizen and strives to help out the needy. By actively contributing back to the society, MDIS aims to break the stigma that its functions are merely profit-driven. Understanding the need to prepare students beyond academic excellence, we have constituted the ‘MDIS Experience’ – which entails a series of personal development workshops/programmes that aspire to build students’ self-confidence, creativity and communication skills. To enhance students’ learning opportunities and experiences, the Institute organises a myriad of activities such as industry visits, community outreach initiatives, overseas student exchange programmes, cultural events, bazaars, sports activities and Student Council that students can engage in and be part of the MDIS family. Over the last decade, MDIS has also established facilities and enhancements to the benefit of local and international students, working professionals and the public; and provided community support in its immediate neighbourhood and beyond. MDIS will continue to forge the trust and reputation as the choice institution of learning and an educator with a heart. 5. Why did MDIS decide to participate in E50 Awards? The Enterprise 50 Awards has been a mark of excellence in the business environment. MDIS’ participation is aimed at being recognized as one of the top companies locally and amongst the PEIs. Winning the award will recognize the efforts of our staff in their contribution to the success of the Institute. Externally, the award will build another layer of confidence with our University and Industry partners. By participating, MDIS will also have an internal benchmark to measure the success of our processes and decisions. Lastly, this year’s Enterprise 50 theme, "Innovate, Grow & Succeed: Staying competitive in today's economy", is extra significant to MDIS. As a heritage brand of 61 years, MDIS wants to prove that heritage does not equate to being out-of-touch. We possess the necessary processes and mindset as an organisation to stay relevant in the industry, grow and succeed. With the institute circling all processes around this concept, we can be sure that our graduates will be industry-relevant and future-ready after their education at MDIS. 6. How does it intend to benefit from its win? With the win, MDIS has an additional affirmation that our processes, business model and “entrepreneurial” focus are on the right track. The Institute will continue with our best practices and seek to be more productive and continue our growth. As a heritage brand of 61 years, the win is testament to our efforts in being productive and staying relevant. As the only Private Education Institute (PEI) to win this award, we hope to serve a benchmark and inspire the rest of the industry towards excellence as well. With the win, we will also be using this accolade in our marketing collaterals or corporate presentations where appropriate as a mark of business excellence. This will certainly help in forging new collaborative partnerships with external partners. 7. What are some of MDIS’ biggest challenges? Over the last 3 years, the Private Education sector was affected by the dipping student enrolment, particularly the local students. This was attributed by the increase in university places, especially at the Singapore Institute of Technology and Singapore University of Social Sciences, which caters to polytechnic graduates. The number of local students is expected to fall further as the Government has pledged to increase the yearly intake for the six universities from 15,000 now to 16,000 by 2020. We are also experiencing declines in International student numbers. This is largely caused by two reasons. The rising cost of living is one factor attributing to the fall in foreign student numbers here. Coupled with a rising Singapore dollar, it has become increasingly unattractive for a foreign student to study in Singapore. Another reason is that countries such as the United States, United Kingdom and Australia are wooing students directly from the region as well. With a relatively lower cost of living, and enjoying direct admission to the universities, this option gains popularity amongst students that can negate the language barrier or adapt to the difference in culture. Besides foreign competition, the private education industry in Singapore is highly competitive. There are 287* PEIs registered with CPE in Singapore, of which 125* have Edutrust certification. Every student interested in studying in Singapore has an abundance of choice. 8. What are some of MDIS’ plans for the near future? MDIS is also exploring the feasibility of establishing a presence and/or collaborative partnerships in countries such as Indonesia, Myanmar, Sri Lanka, Philippines, etc. We will be delivering our “Singapore Brand Education” in the region to not only achieve growth for MDIS, but also to contribute in solidifying Singapore’s reputation as a strong regional education hub. Enrollment numbers have exceeded full capacity at the moment. We have plans to expand the campus further and improve teaching quality over the next three years. We will be looking at accommodating up to 5000 students with the expansion. Presently, more than 500 students are studying out of the City Campus at City Square Mall in Johor, Malaysia. With the completion of the first phase of construction of our Iskandar campus, the institute will be able to accommodate up to 2000 students. MDIS will be expanding the range of Workforce Skills Qualification (WSQ) Approved Courses, which are jointly awarded by overseas institutions/universities and will help enhance the capabilities, productivity and growth of the workforce. MDIS will be further developing the following courses under the WSQ framework which will help provide qualifications for the local workforce. In supporting the government in tackling challenges of a slowing economy, technological disruptions, and greying population that the country will face in the next 50 years, MDIS will be providing more industry-relevant courses with applied learning opportunities that are SkillsFuture Credit Eligible. In our efforts of shaping future-ready graduates, another core focus for MDIS will be in developing stronger industry partnerships. These collaborative partnerships with industry partners provide crucial opportunities for students to gain practical experience in their field and develop relevant skills. MDIS aims to have 100 new partnerships over the next 3 years.